Elphel has embarked on a new project, somewhat different from our main field of designing digital cameras, but closely related to the camera applications and aimed to further improve image quality of Eyesis4π camera. Eyesis4π is a high resolution full-sphere panoramic and stereophotogrammetric camera. It is a tiled multi-sensor system with a single sensor’s format of 1/2.5″. The specific requirement of such system is uniform angular resolution, since there is no center in a panoramic image. Lens selection for the camera was dictated by small form factor among other parameters and after testing a dozen of different lenses we have selected N125B04518IR, by Evetar, to be used in Eyesis4π panoramic camera. It is M12 mount (also called board lens), EFL=4.5mm, F/1.8 lens with the same 1/2.5″ format as camera’s sensor. This sensor is perfected by volume production and wide use in security and machine vision applications, which contributed to it’s high performance at a relatively low price. At the same time the price-quality balance for board lenses has mostly shifted to the lower price, and while these lenses provide good quality in the center of the image the resolution in the corners is lower and aberrations are worse. 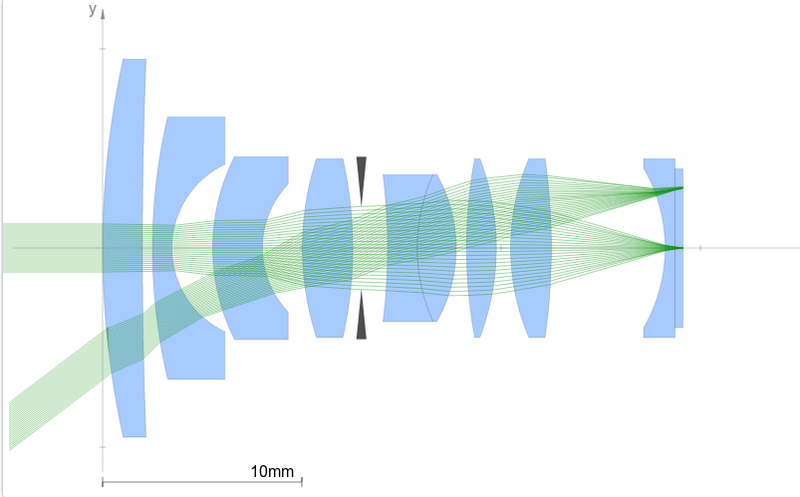 Each lens of the same model is slightly different from another, it’s overall resolution, resolution in the corners, and aberrations vary, so we have developed a more or less universal method to measure the optical parameters of the sensor-lens module that allows us to select the best lenses from a received batch. This helped us to formulate quantitative parameters to compare lens performance for our application. We have also researched other options. For example, there are compact lenses for smaller formats (used in smartphones) but most, if not all of them are designed to be integrated with the device. On the consumer cameras side better lenses are mostly designed for formats of at least 3/4″. C-mount lenses we use with other Elphel camera models are too large for Eyesis4π panoramic camera sensor-lens module layout. In panoramic application and other multi-sensor tiled cameras we are designing the center can be set anywhere and none of the board lenses (and other lenses) we have tested could provide the desirable uniform angular resolution. Thus there is a strong interest to have the lens designed in response to panoramic application requirements. Our first approach was to order custom design from lens manufacturers, but it proved to be rather difficult to specify the lens parameters, based on a standard specifications list we were offered to fill out. The designed lens will be subjected to the tests similar to the ones we use in actual camera calibration before it is manufactured. This way we can simulate the virtual optical design and make corrections based on it’s performance, to ensure that the designed lens satisfies our requirements before we even have the prototype. To be able to do that we realized that we need to be involved in the lens design process much more then just provide the manufacturer our list of specifications. Not having an optical engineer on board (although Andrey had majored in Optics at Moscow Institute for Physics and Technology, but worked only with laser components, and has no actual experience of lens design) we decided to get professional help from Optics For Hire with initial lens design and meanwhile getting familiar with optical design software (OSLO 6.6) – trying to create an error (merit) function that formalizes our requirements. In short, the goal is to minimize the RMS of squared spot sizes (averaging 4th power) over the full field of view taking into account the pixel’s spectral range. Right now we are trying to implement custom operands for minimization using OSLO software. As always with Elphel developments the lens design will be published under CERN Open Hardware License v1.2 and available on github – some early files are already there. We would like to invite feedback from people who are experienced in optical design to help us to find new solutions and avoid mistakes. To make it easier to participate in our efforts we are working on the online demonstration page that helps to visualize optical designs created in Zemax and OSLO. Once the lens design is finished it will be measured using Elphel set-up and software and measurement results will be also published. 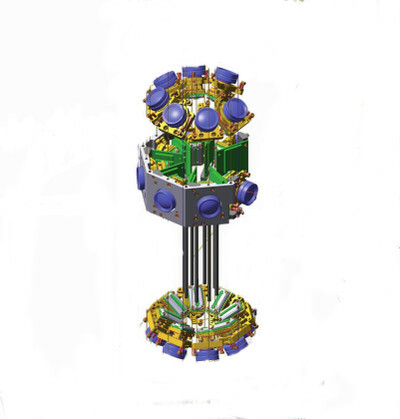 Other developers can use this project to create derivative designs , optimized for other applications and lens manufacturers can produce this lens as is, according to the freedoms of CERN OHL.